Sheila is a Sound Healer, Musician & Teacher with a background in classical music. As a professional violinist, having studied at the Royal College of Music, she had a thriving career in the mainstream classical music world for many years, both playing & teaching. Over 20 years ago she became a Sound Healer, obeying the call to use her musical abilities in a more focused Holistic way. During the last 15 years she has specialised in using large high quality gongs for her Sound Healing work. Sheila is a course tutor for the UK College of Sound Healing. 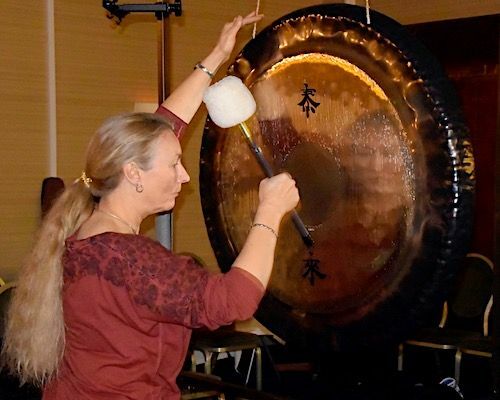 She runs the Gong Practitioner Training Course for the College, sharing the gong teachings every year with new groups of students, and giving other gong and sound healing workshops. For two years she was Chairperson for the College, and continues to serve the College as an advisor on all matters gong-related. In 2010 Sheila wrote & published her first book : “Sound Healing with Gongs – a Gong book for Beginners”. Her second book : “In the Heart of the Gong Space – the Gong as a Spiritual Tool” followed in October 2012. She has recorded several gong CD’s, appeared on the radio, & has many gong videos on YouTube. She is a member of the CMA & the UK Sound Healers Association, & runs a private therapy & teaching practice in Devon.